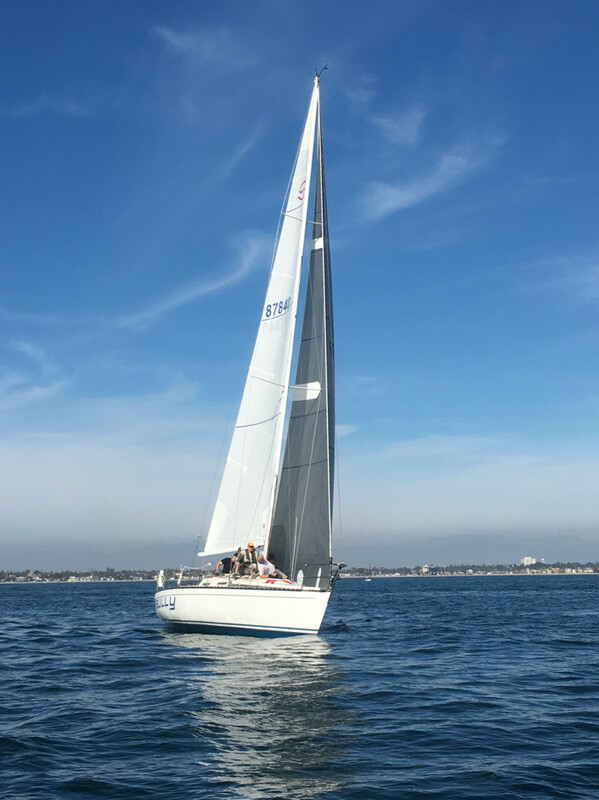 Seal Beach Yacht Club’s annual “Sunday Sailor Series,” in Long Beach, CA, began its first-of-three weekends with wind conditions very uncharacteristic of the typically breezy venue. The fleet of 39 entries sailed in 3 to 6 knots of breeze all day with wind shifts and puffs across the course keeping things interesting for all classes. California’s Schock 35 fleet has been growing and established a one-design class for the regatta with 5 entries. “Impulse,” skippered by Bob Anderson, caught the first shift on the right side of the course and led the Schocks until the final leeward leg when an error in their spinnaker set allowed “Code Blue,” skippered by Dave Michaelis, to capitalize and take the lead to the finish. “Code Blue,” and “Impulse,” took first and second place, powered by a 100% Ullman Sails inventory, and “Whiplash,” skippered by John Rossbach took third place, also powered by Ullman Sails in his inventory. The PHRF fleets had their share of excitement in the light and shifty conditions. Farr 40’s “Blade 2,” skippered by Mick Schlens and “Temptress,” skippered by Ray Godwin, kept in a fast mode for light air and sat atop the podium of the 9 entries in A-Fleet. “Jazz,” skippered by Mark Itnyre and powered 100% by Ullman Sails, sailed an excellent tactical race to come out on top of the 10 entries in a very competitive B-Fleet. “Growlie,” a Flying Tiger 7.5 sportboat, skippered by Bill Johnson and powered by Ullman Sails, capitalized on the light conditions to win against the 9 entries in C-Fleet. PHRF D had four of its five entries all with the same rating of 186. The day made for match racing within a fleet race with “Fiat Lux,” an Ullman powered Ericson 28, skippered by Jim Moreau and “Giant Slayer,” a 100% Ullman powered Hunter 28.5, skippered by Cole Price, mixing it up tack-for-tack and gybe-for-gybe around the course with Jim coming out on top of D-Fleet, beating the team on “Giant Slayer,” by only 38 seconds. Anyone can make a boat move well in breeze. It is the light air days that challenge a crew to squeak every fraction of a knot of speed they can out of a boat. Sunday was a good test of crews in Long Beach, however, with two more races left in the regatta in future weekends- it’s still anyone’s race. Consistency will determine the winners when the dust settles after the final race on December 4th.